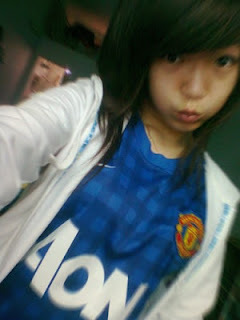 Fan of Manchester United since: 3 years. 1. Why did you start to support Manchester United? When I was 15-16 years old, I just love football. My first introduction to Manchester United came when my dad was showing me old videos of MU and he was pointing out all the great MU players whose names I cannot remember clearly. That was it for me; there was never going to be another team for me, and ever since then Manchester United have been my team. My love has continued to grow and grow and grow. 2. Who is your favorite player this season? Robin van Persie. 4. Have you been to Manchester United match? I just watch on Tv, internet. 5. Have you been to Old Trafford? Really expect, but not. 6. What is the best memorable moment you had with the club? All the time I watch MU. 7. What do you think about Alex Ferguson? He is footballs biggest ever managerial rivalry. 8. If you were the manager of Manchester United, who's the player, you would bring to the club? I believe in Sir, so I choose all player like he choose. 9. Is there a player in the club that you don't like? No one. 10. What will be the achievements of the club this season? Win a cup. 11. What makes Manchester United as a special club in comparison to other football clubs in the world? Excellent manager, perfect players and fans.